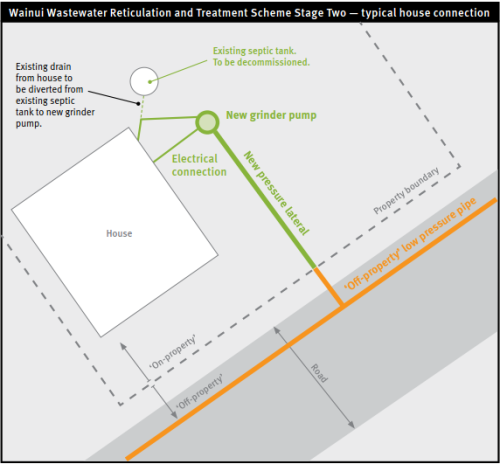 Wainui wastewater reticulation and treatment scheme. The Council decided through its Long Term Plan to proceed with the final stage of the Wainui wastewater upgrade scheme in 2026 - 2028. A cost-share proposal between the Council and property owners to deliver the project. Deferring delivery of the scheme, for inclusion in the 2018-28 Long Term Plan. Proceeding as planned (financial year beginning 1 July 2015). Stage one of the Wainui wastewater upgrade was completed in May 2013, removing the treated wastewater being discharged into the Akaroa Harbour. The second stage of the scheme, which is the subject of this consultation, is to provide individual properties with a reticulated wastewater system and new treatment plant that will discharge to land. Consultation on three options for the future delivery of the Scheme took place from 9 March to 30 March 2015. During the consultation period 88 submissions were received. All responses were analysed for a report considered by the Infrastructure, Transport and Environment Committee. The Committee made its recommendation which went to the Council on the 23 June for its decision. Wainui is a small, largely holiday settlement with a current permanent population of 111 residents (Census 2013). Peak population levels are 700–800 persons during a three week period in December–January. There are approximately 160 homes in total, of which 60 house the permanent residents. Wastewater from the 34 properties comprising the subdivision in Seaview Lane are serviced by a small treatment plant built by the developer which, until 2013, discharged treated wastewater into Akaroa Harbour. All other properties in the Wainui settlement are serviced by private septic tanks, long drops or storage tanks. Stage One of the Wainui Wastewater Reticulation and Treatment Scheme has seen treated wastewater from the Seaview Lane Wastewater Treatment Plant diverted from Akaroa Harbour to a Council-owned land discharge in the forestry block above Warnerville Road. This work was completed in May 2013. This removed the treated wastewater from the Harbour. The second stage of the Scheme is to provide the rest of the residents with a reticulated wastewater disposal system. The proposed Scheme is a low pressure sewer system using small on-property pressure grinder pumps to pump untreated wastewater from each property to a new treatment plant located near the top of Warnerville Road. Treated discharge from this plant will be irrigated on the Council-owned forestry block. This Stage also includes the diversion of wastewater from the properties comprising the Seaview Lane subdivision from the Seaview Lane Wastewater Treatment Plant, which is located on private property, to the new treatment plant at the top of Warnerville Road. This would allow for the decommissioning and removal of Seaview Lane Wastewater Treatment Plant and the return of the land to its owner. Stage Two work was scheduled to begin in October 2014. This has now been put on hold while the Council seeks the views of Wainui residents, and the wider community, on possible future options for the delivery of the Scheme. Many homes in Wainui settlement have long-drops, septic tanks or storage tanks for the disposal of their wastewater. Issues can arise with these systems especially with older systems, some of which can be more than 50 years old. For example, septic tanks have a land-based effluent discharge. With heavy or prolonged rain, effluent has the potential to leech into waterways and enter the Harbour. There are approximately 126 properties with either long-drops, septic tanks or storage tanks. Monitoring of water quality in Wainui Bay is carried out by Environment Canterbury (ECan) regularly in the summer holiday period. ECan monitoring grades the Harbour water as ‘good’ and does not show any marked impacts of these disposal systems on the Harbour water quality, except following wet weather events when bacterial numbers in the water are higher. The main environmental issue, to remove treated wastewater discharge into Akaroa Harbour, was addressed successfully in Stage One of the Wainui Wastewater Reticulation and Treatment Scheme. A pressure sewer reticulated wastewater disposal system is well suited for low density semi-rural communities and rural landscape. It consists of a pumping unit housed in a plastic holding tank which is buried on a property. The holding tank receives wastewater from a house, which is then pumped into the wastewater network and up to the new treatment plant. With this system there is minimal chance of leakages or overflows. Therefore, it is an environmentally-friendly option. Existing and new properties in the townships will be able to install the pumping unit and holding tank, and connect to the wastewater network. This is a sustainable and resilient option in the long-term for managing the wastewater in a spread-out and growing community. Christchurch City Council has undertaken a strategic planning study of the settlements of the Akaroa Harbour Basin. The purpose of this study was to take an integrated, long-term view (25–30 years) of land use change and other issues within the settlements of the harbour basin and incorporate the local community's preferences on how future land use changes should be managed. To find out more, and what this study says about Wainui’s future development(external link). Banks Peninsula District Council first reported failing septic tanks in the Wainui settlement in July 1996 and a residents' survey showed that the majority of residents favoured a full wastewater scheme that did not discharge into the Harbour. Consultation about the provision of water and wastewater services started prior to this time. The Banks Peninsula Community Plan, current in September 2004, indicated that detailed investigations for the Wainui Sewerage Scheme would be completed in the 2006/07 financial year. 2006 to 2014 The Scheme is included in the Banks Peninsula District Council’s 2006 Long Term Council Community Plan (LTCCP), the Council’s LTCCP and the Council’s Christchurch City 2013 Three Year Plan. 2011 A resource consent for the new plant and discharge to land obtained from Environment Canterbury (ECan). 2012 A report from GHD Consultants confirmed that a pressure wastewater system was the recommended option for Wainui because of technical, cost, environmental and resilience reasons. June 2012 to 2014 Ongoing communication with property owners about the timeframe for the Scheme. Approximately 95 per cent of landowners have provided the Council with consent forms for the system to be installed on their property. That the Wainui Wastewater Reticulation and Treatment Scheme Stage Two is progressed to the construction stage through a project cost-sharing arrangement between the Council and property owners who choose to take part in the Scheme. Option One proposes a cost-sharing arrangement where the Council pays for all off-property works for the total Scheme, as proposed. The Council will also pay for on-property works for residents who sign-up to the cost-sharing arrangement, but these will be reimbursed by the property owners. For the Scheme to proceed, a minimum of 50 per cent of Wainui residents would need to join the cost-sharing arrangement. The estimated cost to property owners under Option One is $20,000. All work to be carried out by the Christchurch City Council. Cost of 'Off-property works' is responsibility of the Christchurch City Council. Cost of 'On-property works' is responsibility of the property owner. Installing, owning and maintaining the off-property wastewater main, as proposed. Ownership, installation and maintenance of on-property grinder pump, holding tank unit and connection to off-property wastewater main. Installing the on-property connection from the grinder pump to the household plumbing, including provision for the electrical connection. Making payments for their portion of the Scheme, as arranged with the Council. Ongoing maintenance of the on-property sewer connection from the house to the grinder pump unit. Paying for the power to run the grinder pump unit. Currently there will be a small cost of approximately $2 a month (about $25 per annum*) to the property owner for the power used by the pump. This equates to the cost to run a 100 watt lamp for three hours a night. The decommissioning of the existing septic tank. As a result of project cost-sharing arrangement, the Council will be able to recoup the cost of installing on-property works, which can be reprioritised to the Land Drainage Recovery Programme and earthquake-damaged infrastructure. The Council can negotiate one main contract for the Scheme, which means possible cost savings and a coordinated work schedule. The Council will be the owner of all on-property grinder pumps, holding tank units and laterals from the pump to the property boundary. This will ensure the system is well maintained and operating efficiently. Wastewater infrastructure will be in place to allow for Wainui’s residential development and growth. Wastewater infrastructure will be in place to allow the YMCA Camp to upgrade their on-site wastewater system for their current and future needs. Following the consultation period, if a minimum of 50 per cent of existing property owners agree to join the cost-sharing arrangements, elected members may consider delivering the Scheme earlier. Not all property owners may choose to enter into a project cost-sharing arrangement with the Council. This may mean some people will continue with their current wastewater disposal system, this includes long-drops, septic tanks and storage tanks. The environmental and public health benefits of the full Scheme will, therefore, not be achieved. The affordability of Option One is dependant on the number of people choosing to enter into a project cost-sharing arrangement with the Council. Depending on the number of people who choose to join the Scheme, the cost benefit may be compromised if too few people choose to join. In addition, if an insufficient number of people — less than 50 per cent — choose this option it may not go ahead. Wairewa and Ōnuku Rūnanga, as Tāngata Whenua for the Wainui area, supported the Stage One of the Wainui Wastewater Reticulation and Treatment Scheme, where treated wastewater from the Seaview Lane Wastewater Treatment Plant was diverted to a Council-owned forestry block above Warnerville Road. A cost-sharing arrangement may mean some properties continue with their current wastewater disposal system. This may not meet Rūnanga expectations for eliminating the threat of untreated or partially treated wastewater entering the Harbour. Deferring the delivery of the Wainui Wastewater Reticulation and Treatment Scheme StageTwo for inclusion in the 2018/2028 LTP. That the Wainui Wastewater Reticulation and Treatment Scheme Stage Two is deferred for inclusion in the 2018/2028 LTP. This option will mean residents in the Wainui township (except those currently in the Seaview Lane subdivision, who have a reticulated system) will not get a Council-funded reticulated wastewater disposal system in the next three years. The Council will then reconsider the delivery of the Scheme as part of the 2018/2028 LTP. Residents will continue with their current wastewater disposal system, this includes long-drops, septic tanks or storage tanks. A future date may see improved technology for wastewater disposal. The current funds allocated for the Stage Two Wainui Wastewater Reticulation and Treatment Scheme can be reprioritised to the Land Drainage Recovery Programme and earthquake-damaged infrastructure at a time when there are significant constraints on the capital available to the Council. Deferral of implementation costs associated with this option. The proposed Stage Two reticulated wastewater disposal system is an environmentally-friendly, resilient and sustainable option in comparison to other methods of wastewater disposal, such as septic tanks. Not proceeding with the Scheme until the 2018/2028 LTP, will mean residents will need to continue with their current wastewater disposal system, this includes long-drops, septic tanks or storage tanks. A reticulated wastewater system achieves better public health outcomes than systems such as septic tanks and long drops. Not considering the Scheme for another three years, will mean residents will need to continue with their current wastewater disposal system, this includes long-drops, septic tanks or storage tanks. The existing Seaview Wastewater Treatment Plant, that was due to be decommissioned by 2015, will need upgrading and maintenance. The Council is responsible for funding its continued operation. The proposed Stage Two pressure sewer reticulated wastewater disposal system could be beneficial for encouraging future residential development and growth of the township. Not considering the proposed Scheme until the 2018/2028 LTP, may impact on Wainui’s residential development and growth. The YMCA Camp requires an urgent wastewater upgrade. With Option Two, the YMCA will need to explore an alternative wastewater disposal system for their current and future needs. This could lead to wasted capital in the long run. Wairewa and Ōnuku Rūnanga, as Tāngata Whenua for the Wainui area, supported Stage One of the Wainui Wastewater Reticulation and Treatment Scheme, where treated wastewater from the Seaview Lane Wastewater Treatment Plant was diverted to a Council-owned forestry block above Warnerville Road. Not considering the proposed Scheme until the 2018/2028 LTP, may not meet Rūnanga expectations for eliminating the threat of untreated wastewater entering the Harbour. There will be a future capital cost increase for the Stage Two work. Continue with the Stage Two Wainui Wastewater Reticulation and Treatment Scheme as planned (financial year beginning 1 July 2015). That the Wainui Wastewater Reticulation and Treatment Scheme Stage Two continues as planned for the financial year beginning 1 July 2015. This option will provide residents with a reticulated wastewater disposal system. The Council will install, own and maintain all new equipment up to and including the new grinder pump and holding tank unit. The Council will also install and pay for the connection from the pump to the household plumbing, including the electrical connection. Ongoing maintenance of the on-property sewer drainage pipe work from the house to the pump unit. Paying for the power to run the grinder pump system. Currently there will be a small cost of approximately $2 a month (about $25 per annum*) to the property owner for the power used by the pump. This equates to the cost to run a 100 watt lamp for three hours a night. The proposed Stage Two pressure sewer reticulated wastewater disposal system is an environmentally-friendly, resilient and sustainable option in comparison to other methods of wastewater disposal, such as septic tanks. A reticulated wastewater disposal system achieves better public health outcomes than systems such as septic tanks, long drops or storage tanks. The existing Seaview Wastewater Treatment Plant can be decommissioned by 2016 as planned when the new Scheme comes on-line. The proposed Stage Two pressure sewer reticulated wastewater disposal system could be beneficial for encouraging future residential development and growth of the township. Wairewa and Ōnuku Rūnanga, as Tāngata Whenua for the Wainui area, supported Stage One of the Wainui Wastewater Reticulation and Treatment Scheme, where treated wastewater from the Seaview Lane Wastewater Treatment Plant was diverted to a Council-owned forestry block above Warnerville Road. Proceeding with the proposed Stage Two of the Scheme will meet Rūnanga expectations for eliminating the threat of untreated wastewater entering the Harbour. Continuing with the proposed Stage Two of the Scheme will mean the YMCA can join the Scheme and will not need to explore alternative options for the disposal of its wastewater. Continuing with the Wainui Wastewater Reticulation and Treatment Scheme Stage Two as planned (for the financial year beginning 1 July 2015) means there will be less funds available to reprioritise for the rebuild and essential infrastructure elsewhere in the city. No deferral of implementation costs.